Garden web sites can provide so much garden know how and deliver ideas galore! I wanted to provide you with great gardening links from around the web that will give you some excellent information, ideas and how to’s that I just haven’t managed to get to yet! I am providing links to garden web sites that I enjoy and that I think provide excellent information that you can use when designing your garden. Why make you wait for information that will help you create better designs, just because I haven’t managed to write about them yet! These sites are resources that I have found in my own garden research or that have been suggested to me by others who have liked them. I hope you will find them to be the great resources I think that they are. By including these garden web sites, I hope to give you a set of resources that will allow you to branch out into areas of interest that I may never cover, or that I will not be adding to the site for several months. Should you find that any of these links do not work, please do contact me and let me know. I hope you enjoy these links, and that you find them of use to you as you design your own personal garden paradise! Drought Smart Plants - Live in the desert? You need a xeriscape garden! This site is chock full of ideas about growing, and designing with, drought tolerant plants. I love the page on landscaping with miniature succulents. Blue Fox Farm - Love Rustic? 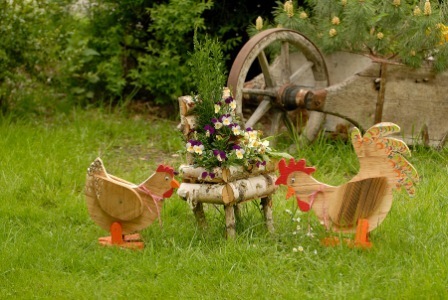 Check out this excellent site for some exciting garden craft ideas. I absolutely love this site. It speaks to my artsy side! Check out all the great projects that Jacki has lined up for you. Learning with Experts - Learn from experts such as Dr. Toby Musgrave, Noel Kingsbury, and Jaqueline van der Kloet! Peter and Carol Bricel Garden - You'll spend hours touring this wonderful, home landscaped garden by Peter and Carol Bricel in the Pacific Northwest, USA! An incredible example of what you can achieve by keeping in mind the garden design principles we promote on this site.